In 1986 Vietnam started a transition to Doi Moi, a market-driven economy that moved forest management from exclusive government control to a more multi-sector approach involving NGOs, businesses, local communities and management boards. Vietnam was a REDD pilot country in 2008 and has additional backing from the UN and the Forest Carbon Partnership Facility for reforestation efforts and greenhouse gas emissions reduction. 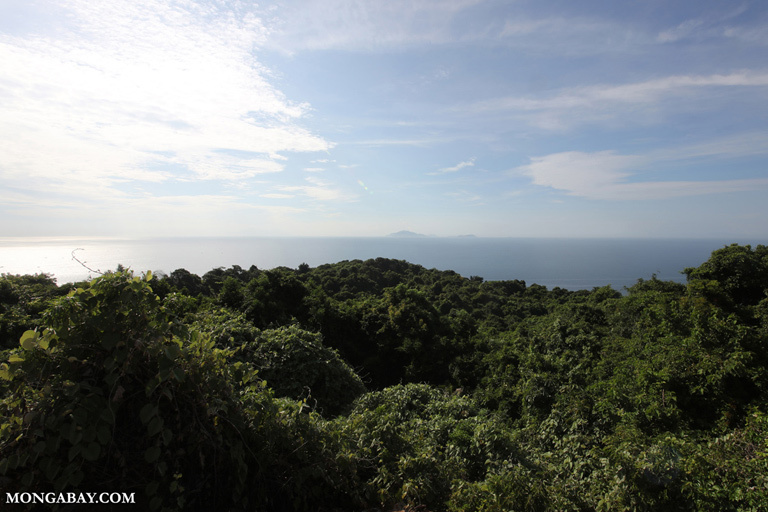 Including reforestation as a part of a larger strategy to protect the country against climate change has become part of the national platform in Vietnam. As the world moves into an era above the ominous 400 parts per million carbon dioxide threshold, carbon storage and reforestation are becoming even more significant. In Southeast Asia, Vietnam has been largely successful in rehabilitating its lost and damaged forests over the past 15 years. Yet even as one country ups its canopy cover, the larger global problem of deforestation hasn’t eased. 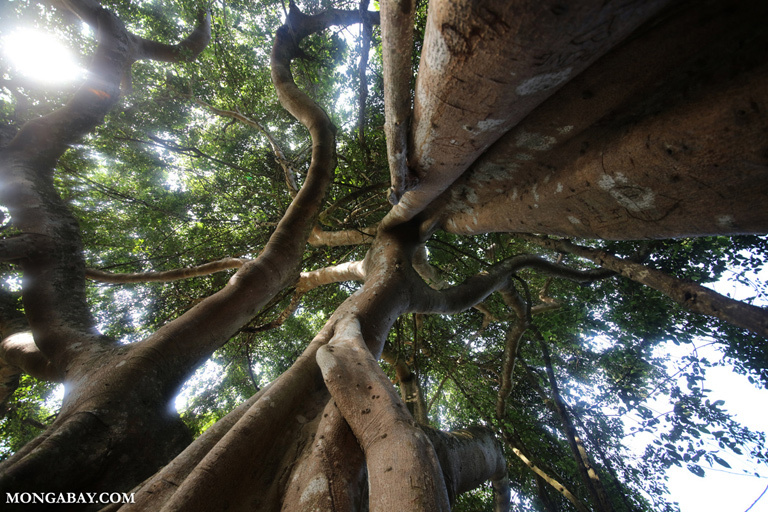 It’s been almost 50 years since attacks on Vietnam’s southern forests hit their peak in 1967. In a single year, the United States sprayed over 5 million gallons of defoliants, including Agent Orange, across more than 600,000 hectares. They were trying to eliminate forest cover that provided a hiding place for the North Vietnamese and Viet Cong troops, as well as crops. The extent of damage caused during the decade-long spraying campaign is hard to quantify. Estimates place affected forest cover in the range from 14-44 percent, with the most severe damage on coastal mangrove forests. In the regions hit heavily by chemical herbicides during the war, grasslands quickly took over. These are areas that researchers from Vietnam’s Huế University and Australia’s University of Queensland have deemed will be unlikely to recover in the short term without interventions. Defoliation gave way to domestically-driven forest degradation, as the country sought to rebuild from logging, slash-and-burn agriculture, and land encroachment. By 1999, foreign analysts estimated forest cover across Vietnam to be as low as 10 percent, though more conservative estimates by researchers at the Forest Science Institute of Vietnam estimate 30 percent. Even with conservative estimates, the future of Vietnam’s forests looked grim by the mid-1980s and the government began to take note. In 1986, the country began to transition toward a market-driven economy, known as Doi Moi. Within that framework, forest management also moved from exclusive government control to a more multi-sector approach involving NGOs, businesses, local communities and management boards. Forests were soon classified into three categories: special-use (national parks, conservation and historical areas), protection (watersheds, storm and wave barriers) and production (industry). The classifications remain in place today. According to Phuc Xuan To, the Vietnam analyst for U.S.-based non-profit Forest Trends, an important part of this process was a policy of devolution of forest control. This gives individuals incentive to care for their land, and the impact has been beneficial for both the people and the trees. Beyond transferring management, the government began passing a series of laws to protect forest health and support reforestation at the turn of the century. It also started expanding its relationship with international partners aimed at environmental conservation. The UN’s REDD+ program, (Reducing Emissions from Deforestation and forest Degradation in developing countries), an international effort dedicated to stopping deforestation and climate change, lists Vietnam as one of its earliest collaborators. It became a REDD pilot country in 2008. Soon after, Vietnam got international backing from the UN and the Forest Carbon Partnership Facility under the World Bank to implement reforestation efforts and reduce greenhouse gas emissions. Four years later, at the 2012 COP18 summit, Vietnam received more international support, signing a joint declaration with Norway to reduce emissions caused by deforestation and to increase carbon removal through replanting. International and local efforts to protect existing forests and to replant hectares-lost have helped Vietnam chart a more sustainable course for the future; but the country still has many challenges to navigate ahead. By 2011 Forest Trends found tree coverage in Vietnam nearing pre-war levels, with all three classifications of forests comprising 40.2 percent of its land area. Similarly, the Food and Agriculture Organization of the UN has consistently listed Vietnam’s forests as moderately expanding between 1990 and 2015. In semi-toxic areas once defoliated by herbicides, researchers have found some success in introducing heartier, exotic tree species like eucalyptus, acacia and pine, to increase soil fertility and provide shade, allowing native species to take root. Most of the land granted to family households during the decentralization of forest management in the 1980s is now used to grow acacias. “Forest cover has been increasing, and the smallholder plantations are key to this recovery,” Phuc, of Forest Trends, said. 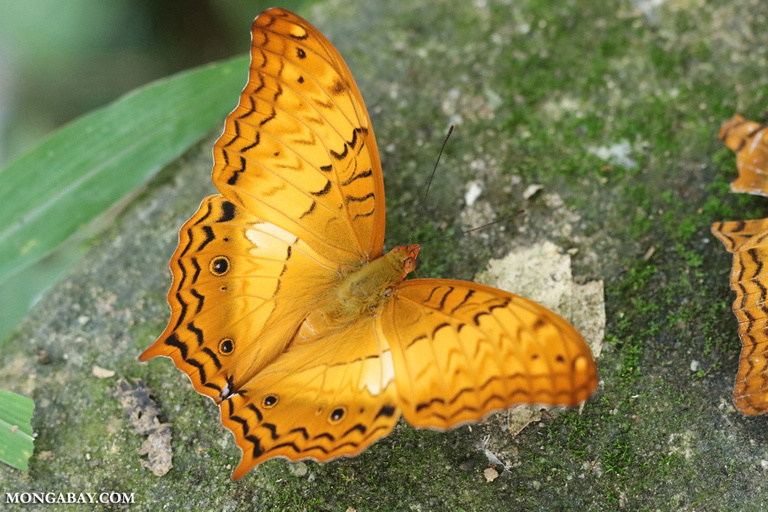 The fast-growing exotic species have also provided some revenue for landowners in deforested areas. However, planting the monocultures does not provide the same level of biodiversity and watershed protection as planting natives – something researchers are placing greater significance on as environmental stresses from climate change intensify. Viewing reforestation as a strategy to protect the country against climate change has become part of the national platform in Vietnam, with great value placed on replanting mangrove trees to protect against sea level rise and intensifying tropical storms. One highly successful mangrove project is the Can Gio Mangrove Biosphere Reserve, located just southeast of Ho Chi Minh City. The area, designated as a World Heritage Site by UNESCO in 2000, has been able to restore almost all of the previously defoliated sites to full health, which UNESCO touts on its website. Much of that success is attributed to replanting efforts by researchers in the Mekong Delta and eco-tourism opportunities that connect both tourists and locals back to the land. Seeing success in places like Can Gio, there is growing emphasis from the central government in Hanoi to increase awareness around climate change and adaptation efforts in cities and rural areas, including reforestation. Phuc agrees that the government is emphasizing the importance of climate change, but this has not necessarily translated into results. Though more projects are taking off and awareness is rising, demand for wood products in Vietnam remains high. Though significant environmental protection is being afforded to forests, Vietnam is far from letting their timber industry die. Instead, the government is seeking to find the best management practices to allow for sustainable logging in production forests, and to continue job growth and economic stimulus. Most remaining old-growth forests in Vietnam are now protected, but demand for wood is placing old-growth forests in Cambodia and elsewhere at risk. Viet Nam News reported this year that from 2010-2015, forest coverage fell almost six percent, or over 300,000 hectares. The loss of coverage was attributed to the difficulty of preventing illegal logging and poverty-driven resource extraction: two issues acknowledged at a national forest management conference held in Vietnam in September 2016. Phuc believes smallholders are the way forward in terms of further forest recovery. 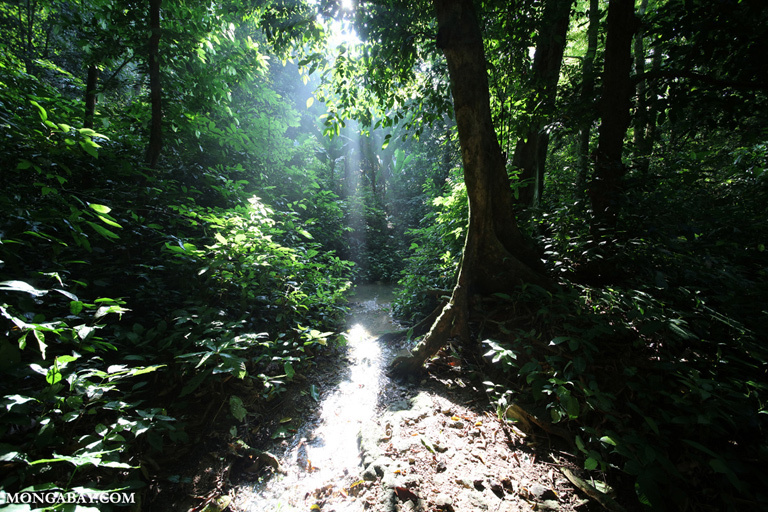 Currently, state companies control the vast majority of Vietnam’s forest land. According to Phuc, about 146 state forest companies manage about 2 million hectares of forest. This is compared to 3.4 million hectares held by smallholders. Coming out of the same forest conference was a proposed plan by the Ministry of Agriculture and Rural Development to stop forest loss in the central highlands of Vietnam. Costs for implementing the plan are estimated to be $886 million between 2016 and 2025, with over half of that expected to come from outside Vietnam’s state budget. In addition to national costs, Forest Trends found that local costs for designing and certifying sustainable management plans for production forests are often prohibitive, leaving many lumber companies unable to certify and disinterested in starting the process. In 2012, the WWF estimated that timber sales prices would need to increase by at least 12 percent to recoup the costs associated with a sustainable forest certification for a 2,000-hectare area. As of 2014, only 136,706 hectares in the country had been certified as sustainably managed. Nonetheless, the WWF’s Ledecq has a positive outlook on certification. Another issue is the quality of the forests that have grown over the last few decades. Phuc argues that, while forest cover has certainly increased, the quality of the growth is poor. Two common cash crops for forest conversion are rubber and cassava. At the moment, global commodity prices are low, so demand for these two products is depressed, especially in China, Vietnam’s largest export market. However, Phuc worries that future increases in rubber and cassava prices could reverse recent forest recovery successes. “A couple of years ago we saw a lot of forest area converted into cassava plantations by smallholders who are very poor, especially poor ethnic minorities in the Central Highlands,” he said. The government couldn’t manage the situation given the small size of the plantations and their remote locations, a problem that could easily repeat itself. While Vietnam has been largely successful at rebuilding forests within its own borders, the country now imports much of its wood from neighboring Cambodia – where logging is often done illegally and unsustainably. Within Cambodia, there has been ongoing violence directed at anti-logging activists, including journalists and foreign and local representatives, and deforestation trends in the nation paint a grim picture for the future if nothing changes. An article released by The Diplomat in September 2016, found Cambodia to be the largest exporter of timber to Vietnam and identified China as the other major player in the region’s forest politics. As both Vietnam and China are major exporters of wooden goods, the problem of deforestation in Cambodia is integrally linked to the global sector. While Vietnam has come a long way in rebuilding its forests over the past 50 years, the problem of deforestation hasn’t disappeared. Instead, as global demand for timber products persists, it has simply been exported. A previous version of this article stated that “about 146 state forest companies manage about 2 billion hectares of forest.” The correct figure is 2 million hectares. Mongabay regrets the error. McNamara, Sean. “Rehabilitating degraded forest land in central Vietnam with mixed native species plantings.” Forest Ecology and Management 233 (2006): 358-365. Sam, Do Ding and Le Quang Trung. “Forest Policy Trends in Vietnam.”People and Forest—Policy and Local Reality in Southeast Asia, the Russian Far East, and Japan. Spring Science+Business Media Dordrecht, 2003. 157-167. Google Books. 20 Sept. 2016. Can Gio Mangrove, UNESCO site accessed 24 Sept. 2016. http://www.unesco.org/new/en/natural-sciences/environment/ecological-sciences/biosphere-reserves/asia-and-the-pacific/vietnam/can-gio-mangrove/. Global Forest Watch, “Vietnam.” http://www.globalforestwatch.org/country/VNM Accessed 23 Sept. 2016. Meyfroidt, Patrick and Eric F. Lambin. “Forest transition in Vietnam and displacement of deforestation abroad.” Proceedings of the National Academy of Sciences of the United States of America 106, 38 (2009): 16139-16144. http://www.pnas.org/content/106/38/16139.full. 22 Sept. 2016. P. 16139. Kibria, Abu SMG. “How Politics is Killing Cambodia’s Forests: Political and economic calculations in Cambodia, China, and Vietnam are contributing to widespread illegal logging.” The Diplmat. 21 Sept. 2016. Accessed 21 Sept. 2016. http://thediplomat.com/2016/09/how-politics-is-killing-cambodias-forests/.